Hip hop is a young man's game. This phrase is echoed in many interviews from multiple emcees. Next month Scarface will turn 45 and will have been in the game for over 25 years. Even though he was not in the first incarnation of the Geto Boys (honestly I only learned that after some research), Face is still considered one of the "original three". Most recognize Scarface, Willie D and Bushwick Bill as the core members of the Geto Boys because it was this combination that spawned the group's most successful single, Mind Playing Tricks On Me. Since then, Face has gone on to be the best-selling solo emcee to come out of Texas. Deeply Rooted is Face's twelfth studio album, after a 7 year gap from Emeritus in 08. I wasn't sure what tracks I wanted to highlight, so I'll start off with the track that's playing in my headphones right now. The single Steer has a religious theme, with the chorus ending in, "Lord if you hear me, steer." The first verse presents Scarface as someone who is grateful and content with his place in life. His finances are straight, he has the support of a good woman and he was able to get to his position by staying true to himself. But there is always that doubt of his past dealings coming back to affect him now. The track transitions for the next two verses with Face going through a violent situation in real time. He has been shot and is running from his attackers. In his panicked state he comes across the police who view him as a threat as well. Face is aware that his situation is still very deadly but will face his destiny head on. One of the final bars is, "I rather be carried by 6 than judged by 12." This bar explains that Scarface would rather die (normally there are 6 pallbearers who carry a casket) than go to prison (there are 12 jurors in a jury). One of the three bonus tracks is called Mental Exorcism. The simple guitar instrumental allows Scarface to "exorcise" his feelings. Face touches on complex subjects like: hustling/street life, suicide, isolation, teenage pregnancy, prison, death, parenting, hell/heaven, religion, racism, news propaganda and police brutality. 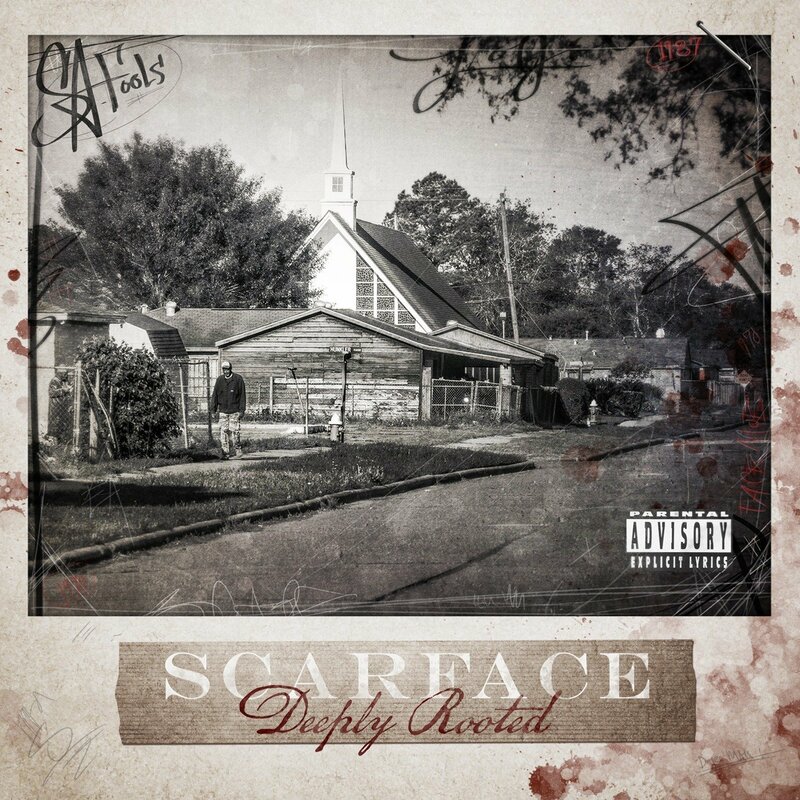 Scarface is not just able to speak about his time in the rap game, he is also able to observe and report on the trials and tribulations of everyday life. While it seems that lately the news has been inundated with horrible and negative stories, Scarface knows that there are segments of the population whose reality has been this way for a long time. Face has been through so much, he has seen so much, and this tracks serves as a therapy session for him to let out what he has been observing for most of his life. In an interview about Deeply Rooted (and other topics), Scarface said, "I don't feel like I have to fit in. I don't even feel like I even should fit in." If everyone is making tracks that talk about women, cars and money in every other word, he is going to do the opposite. Yes, there is a place and time to create tracks about braggadocio and to flaunt your wealth and hit the club, but Scarface feels that right now is not the time. He feels that the majority of the nation can't relate to flashy decadent stories that boast excess material gain. So in a landscape of McDonald's rap (the same simple formula of watered down songs that flood the airways), it is a relief to get a conceptual album full of substance. Face might not be doing a Geto Boys album anytime soon (or at all for that matter, according to what Scarface said after a failed Geto Boys Kickstarter), but the Texas emcee will continue to add to his legend with solid albums like Deeply Rooted.